Startup Veterans Launch Imagine K12, A "Y Combinator For Education Startups"
Everyone thinks they know exactly what schools need to do to start actually educating the youth of America well enough that they’ll have a fighting chance in the world. I, for example, think all we need is to bring good, old fashioned corporal punishment back into our school system. Right after we fire all the teachers, of course. I kid. But opinons really are all over the place. But one thing we all agree on – education could be and needs to be a lot better. Movies like Waiting For Superman help focus the attention on a possible solution. And people like Mark Zuckerberg are trying grande and noble experiments to see if they can make a difference. What if you’re a successful entrepreneur that wants to make real change in education? You find a way to bring technology, capitalism and entrepreneurism into the party, that’s what. Ralston, who was last seen selling his music startup LaLa to Apple in 2009, told me last week over coffee all about the new project. “We don’t have $100 million to give to a foundation like Mark Zuckerberg did, so we’re going to do something different,” he said. The company is called Imagine K12. Like Y Combinator it will hunt for very early stage startups, give them enough funding to get through a few months of coding, and mentor them along the way. Each startup will receive $15,000 – $20,000 and give up an average of 6% of its equity. It’s a model that continues to work very well for Y Combinator . 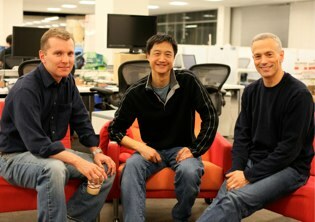 Ralston (pictured right) is joined by cofounders Tim Brady (left), previously CEO of education startup QuestBridge, and Alan Louie (center), who helped create Google.org. The first class will work over the summer. Applications are being accepted until May 1 on their website, and they hope to accept 8 – 10 new companies. Y Combinator, by comparison, accepted more than 40 startups in their most recent batch, and have two separate “classes” per year. We’re big supporters of this project and have been talking to them about it since the beginning. We’ve told them everything about how YC works and brought them in to observe what we do. After they launch we’re going to publish a blog post encouraging startups working on software for schools to apply to them instead of us. I’m pretty excited to be able to do anything to help schools, even indirectly. After I watched Waiting for Superman I felt a bit bummed that I was spending all my time working on startups instead of trying to help schools. So I was delighted when an opportunity to help schools by working on startups dropped into my lap. One of the ways Imagine K12 will help startups is by forging relationships with charter schools, public schools and education platform companies that can provide testing and distribution. “We will be able to test new products very quickly via these partnerships,” Ralston told me. It will certainly help these new startups avoid lengthy and overlapping business development cycles. Imagine K12 is self funded by the three founders, who hope to quickly expand to two classes a year. The company is headquartered in Palo Alto, California, in the new AOL building.